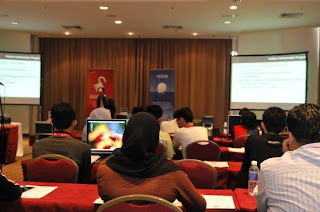 As a platinum sponsor, Red Hat was given a room on 31st May (which was an open / free-to-access day for the event) to do any activity they wished. 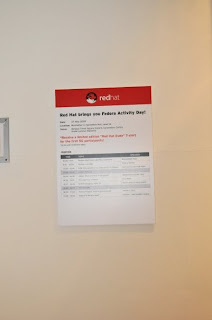 Great thanks to Harish Pillay and crew from Red Hat APJ, that room was given to Fedora-My for our first Fedora Activity Day!. Harish and crew brought along some nice Freedom Infinity Voice banners for the event, and sponsored the large number of Fedora T-Shirts which we gave away to the crowd. 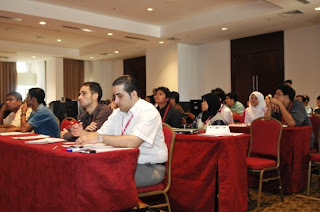 Big thanks to the Red Hat crew :D.
FAD-My 2009 was held in a conference-like style where our local team gave several talks related to Fedora, Fedora features and FOSS in general. Here was the schedule of the last FAD. The turn out was amazing, we had more than 50 attendees in the event (not sure the exact number, some said it reached 80) and the respond from the crowd was great too. 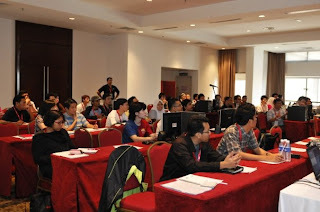 Last but not least, thanks to all who have been involved in the FAD especially Harish Pillay and Red Hat APJ for sponsoring swags, the room, and the whole conference itself. Without that support , the event won't be as successful. To fellow Fedora-My comrades and Fedora users in Malaysia, this is not the end of stuff. More stuff will be coming from us in the near future, so stay tuned :D.